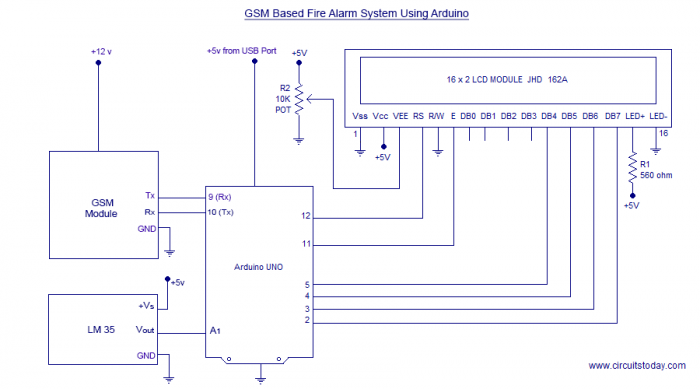 In this article,we are going to build a Fire Alarm System using Arduino, LM35 Temperature Sensor and GSM Module. 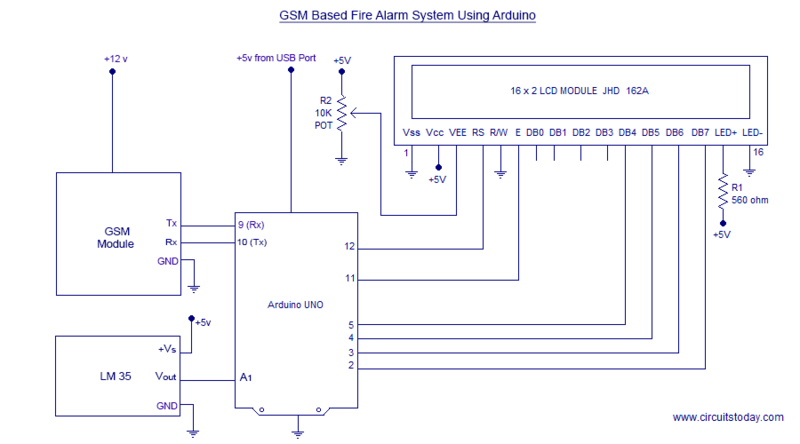 The objectives of this fire detector using arduino is to sense the surroundings for occurrence of fire with help of LM35 temperature sensor, and send 3 SMS alerts to two mobile numbers stored inside the arduino program if fire is detected (using GSM Module). We have developed a very good tutorial onÂ how to interface GSM Module with Arduino and send/receive SMS using GSM module. Interfacing any device with a micro controller is the first step to building a useful system or project with that particular device. In this tutorial, we are going to build a very interesting project – a Fire Alarm System which will send SMS to a set of Mobile Numbers when fire occurs in a particular location. We have seen many typical Fire Alarm projects which will alert with a siren or that activates an automatic shutdown mechanism. This fire alarm project make use of modern communication technologies to deal with emergencies. 1. SMS based Fire Alarm system are very useful in remote locations where human interaction is limited. Such systems are useful in mines, industrial areas, factories etc. 2. Night Owl – We all know owls don’t sleep during night. SMS based Fire Alarm system helps to monitor locations and alert during fire that occurs in night time. 3. Quick Actions to shut down Fire – 90% of fire damages occur due to lack of early fire detection. A fire attack is usually silent and people will know about fire only when it has spread across a large area. SMS based Fire Alert system gives warning immediately to multiple mobile numbers and hence remedy actions can be taken quickly. This helps to prevent major damages and losses created by a fire accident. Note 1:- This same circuit can be used to build an arduino temperature alarm system – where an alert has to be sent or a buzzer has to be turned on when temperature goes above or below a particular level. So lets get to the circuit & coding part! Note 2:- I suppose you already know how to deal with temperature sensor LM35 and you know how to interface GSM Module with Arduino. Please read and learn those two articles before going ahead.. The circuit connections of this arduino fire alarm are very simple to understand and implement. If you are a beginner, read the following tutorials to grasp connections perfectly. So here is our program to monitor Fire Accident and to monitor the Shut Down Process (that should happen after a fire accident)! CheckFire() – is the function which monitors occurrence of a fire 24×7.Â This function fetches the temperature measured by LM35 and stores it to the variable Temp_alert_val for comparison. This temperature value is compared against a set value of 45 degree Celsius. Usually room temperature is between 25 degree Celsius and 30 degree Celsius in tropical areas. This will vary with continents and locations. You have to change this comparison value by measuring the average room temperature of the installation site! If fire occurs, room temperature will cross 45 degrees (within seconds) and an inner subroutine SetAlert() will be invoked. SetAlert() is the function that controls number of SMS alerts sent to each mobile number loaded in the program. The number of SMS alerts sent can be altered by changing the stopping condition of while loop. The stopping condition sms_count<3 – means 3 SMS alerts will be sent to each mobile number. If you want to send 5 alerts, just change the stopping condition to sms_count<5 – you got it ?Â The function to send SMS (using AT Commands) – SendTextMessage() will be called 3 times if SMS alert count is 3. This function SendTextMessage() will be invoked as many times as the number SMS alerts set in the program. Note:- We have limited the number of SMS alerts using the stopping condition. Once a fire accident occurs and the set number of SMS alerts has been sent, the system will not send any more SMS! The system assumes that its job is over by sending SMS. Humans has to come and shut down the fire. After sending alerts, the system will start monitoring Shut Down process. Once the Fire has been shut down, system will reactivate its SMS alert settings by resetting the sms_count variable back to zero. We have tested this project and code in our lab many times before publishing here. I am attaching a photograph of the final output below. If you have any doubt/queries – post in comments section! 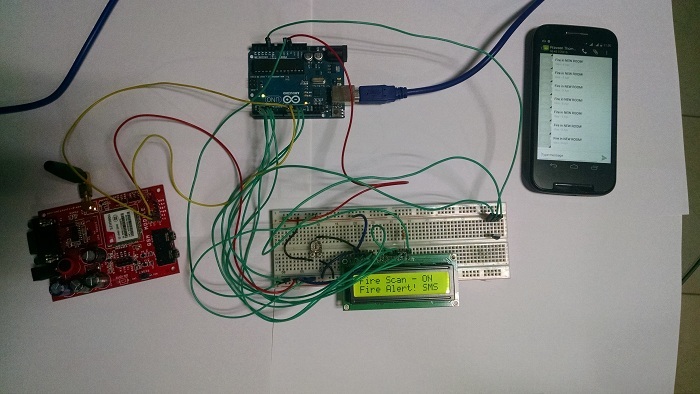 We hope you have built an arduino fire alarm with sms alert successfully! This project is good enough to build a home fire alarm system using arduino.We have more arduino projects for you to try and they are listed below! 1. Gas Leakage Detection using Arduino – is a very interesting project to detect LPG leak or the presence of other types of gases like hydrogen, CO etc. Designed using MQ5, Arduino, GSM Module and Buzzer. 2. Arduino Burglar Alarm – is an intruder alert system using PIR sensor and Arduino. Does this project needs to be connected to a computer all the time!? Hi, this project is similar to mine. But how is it possible to add a siren. Please give the code for siren and how it is compatible. Hello sir good day! What if the homeowner changes his/her phone number? How to change or edit the number? How about changing the number using UI (application) Is that even possible sir? Badly need your thoughts sir for our project. Im just wondering if this device can also use multiple kinds of sensor. So you can i dentified which room the fire occurs . I am using the same LM35,GSM and Arduino to design SMS based temperature monitoring system. The temperature should be 30 degrees celsius. When above or below this value, SMS is send to my mobile phone. Then, I can send SMS to set the temperature to 30 degrees celsius through my mobile phone. Can you please share the code to meet this situation? Kindly. How do I type in those programs? Is this code applicable for Bangladesh? Our country code is 880. How can I show the message ” Fire scan – ON without using GSM module(just for testing the LCD screen and LM35 sensor) I have bought the GSM module SIMCOM SIM900. Do I need to change anything within the code if I use this GSM module? You may double check the program. If you have made any changes to the program, make sure the program flow (control) enters the subroutine to check shut down. Copy the circuit connected to pin 8 or arduino. connect the pump to relay output. so i used SIM900A without shield, and i have a trouble because the GSM doesnt send any message but the two components work well please answer as soon as possible before the deadline. All the best! Here’s a small help from our side. Sir , please provide a video based description about this project,Iam confused about the programs , there are different things we used like temperature detector,GSM module,LCD display,and each one is having different code,we need to merge the all program codes together??????? @Jagan – this is a complete program developed using subroutines. Subroutines are used for easy development and understanding of the program. You may copy this as such and paste into Arduino IDE. Then burn it! i have gsm module 900A ,the code isn’t working with this module. so tell us which module we have to used for this project….. which module you have used in this project..
are you using arduino uno R3 ? Can we replace the lm35 with dht11 and gsm sim900 to sim 800? how can i use the 10k potentiometer? please guide..
and where is the potentiometer in the expected output? 10K Potentiometer is used to adjust the contrast of LCD module. Sir jojo I am a Grade 10 student and working on a LASER alarm project, can i use this code for our laser alarm project ?? or do you know the code for the sending of SMS in a laser alarm ?? Please Sir i really need you help for our project. I hope for your reply. Please write to info@circuitstoday.com describing your project idea. Please help I want to use more than one smoke sensor in different location using one program to control the system . The temperature sensor gets heated up as soon as I connect the circuit to the Arduino. @Bharath – You might have connected the sensor wrongly. Check datasheet of LM35 and connect correctly. i thought of improvising this project by sending alert to fire engine along with the location where fire accident occurred….. so that they can rescue immediately …how about implementing it? hi, is it possible to interface a solenoid valve to the arduino for automatic extunguishing?, and if yes what will a solenoid valve be powered by a 5V from the arduino? You can connect a pump or solenoid valve or whatever actuators you would like. The real point here is you can not connect any of these directly to arduino. You can only send a command to turn these devices ON/OFF from arduino. Inorder to power these devices, you should use a separate power supply (independent of arduino) and in most cases you should use a driving circuitry to drive these devices properly via arduino. You dont need “C” code for Arduino!!! You can write much easily in Arduino Programming Language. Its very much similar to writing in C.
@ uttam – Use AT commands to make a call and your problem is solved. Replace the AT commands for sending SMS with that of to make a call. Does this circuit work for a UK telephone number? Circuit and program is independent of country. Change the mobile number in the program with your country code. can we add two sensors to this system. SMoke and a temperature sensor? yes you can add both sensor but for that u have to change programing and power supply as well. Just want to ask what gsm module did you used? hello , can you tell how can we add the code of a MQ2 sensor to this existing program? should we use a “or” case so arduino can detect both temeprature and smoke? You can connect both LM35 and MQ2 in a single circuit to achieve this objective. @sunny emejuru – Please look at the circuit diagram carefully. Its an LM35, Arduino, a GSM Module and an LCD Module with some resistors! @BASANT – It can be a “ground” problem. You have to make all “ground” connections common at one point. It just means, Ground pins of Arduino, LM35, GSM Module and LCD – all should be connected to a common ground rail. Got it ? @Rohit – We have tested this code many times. Also we use this same code to build our Fire Alarm kits. So we have no doubt about its working. You might have run into some other problem. Can you help me to prepare program for this application & NTC sensor connection. You need to make the following changes. 2. Our program is designed for LM35 – which is a linear sensor. NTC (thermistor) is non linear. You have to calibrate accordingly. would you please give me a design of water level sensor connecting arduino to send sms to the server computer or phone. Good day sirâ€¦ I will be working on a project closely related to yours, and i have a hard time deciding on how can be the information from the arduino-GSM shield be receive by my computer or what devices i have to use. Our proposed system is a fire alarm system that the information will be sent to a cellphone and computer. We will be installing a smoke sensor, gsm shiled, arduino in an establishment the server will be 1 km away. @venny – complex stuffs 😉 You can put the sensor in monitoring area along with arduino and gsm module. The challenge is giving output to a computer/server at 1 KM away. I think you can use internet based communication to achieve this. Send your message over internet from arduino and receive it on PC. can i use smoke detector on that project?? what if in a case of which you want to change the mobile number of an occupant of a house, (i.e not making the mobile number of the sms alert permanent in case of change of occupant in the case of a rented apartment). @Nerissa – For this, you have to collect the mobile number via a keypad interfaced to arduino or via an SMS sent to the mobile number of sim card inserted in the GSM module. In both cases, you need to alter this program. A fresh approach is needed in programming. Memory must be interfaced to save mobile number on power failure. will it work 100% successful???? thanks!! good day! i have a problem uploading the program. it said that the ‘CheckFire’ was not declared in this scope. why is that? @Ridhwan – Its a minor glitch in the code. Scan and rework! sir, how can we include the directory of my serial software ? Sir. Can i add MQ2 smoke sensor in this project ???? as i m a begineer hw will i start to construct my adruino based SMS alert fire alarm system. Can the above circuit be simulated in any simulator before practical implementation? How can I read sms and use that into the program as command in arduino uno. send me the sample program. @Prashant – Refer AT Commands to read sms from GSM module. I’m using and I2C LCD and did the necessary replacements in code and the temperature and alarming messages display on LCD perfectly fine which means the loops and most part of the code works well, just SMS cannot be sent to my phone. Also made sure to change the pins of Tx and Rx that for my Arduino are 0 and 1 and dont know what can be wrong. Would greatly appreciate some help, Thank you! @Jessica – Just check the delays are proper. Also do some trouble shooting. Make sure AT COMMANDS are proper! hiee! i js hv a doubt..hw cn i replace the arduion uno with arduino nano?? n wil d prog that is written for uno change if i replace it with nano?? Check for hardware connections and pins in nano. Change the pins in software accordingly. Also check for instruction compatibility…. sir, what if the device is put on populated areas like squatter areas, how will the device determine if its really a big fire not just a single cigarette smoke or something not really that dangerous? thanks for your help. Good day… sir i just wanted to ask .. what smoke sensor did you used? Good day sir… I will be working on a project closely related to yours, and i have a hard time deciding on how can be the information from the arduino-GSM shield be receive by my computer or what devices i have to use. Our proposed system is a fire alarm system that the information will be sent to a cellphone and computer. We will be installing a smoke sensor, gsm shiled, arduino in an establishment the server will be 1 km away. good day! just want to ask what smoke sensor did you used? @jee – If you don’t see back light of LCD turned (that is LCD not powered up) – you may check power connections (Vcc to +5v, Vss to GND and LED+ to +5v and LED- to GND). If the back light is ON and character is not displaying, you may adjust the potentiometer connected Vee. how can i assure that it will function? ?